The grid method is one of the methods I teach to my art students. It involves making grid lines on the picture you are drawing and on the paper you are drawing on. You draw what you see in each square and when you are done you erase the grid lines. Here is a Halloween card made by one of my 9 year old students. Happy Halloween! 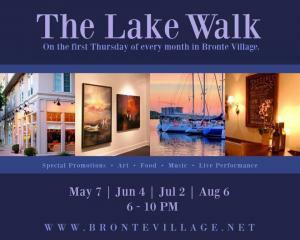 I am really looking forward to the Lake Walk in Bronte, Oakville, Ontario. I will be selling my original artwork and art on cards at 77 Bronte Rd., just South of Lakeshore. Thank-you to Travel Further Afield for hosting me! I am very happy to have a Solo Show at CJ's Caf� in Bronte. Check out my CJ's gallery online to see some of the art that I have up for March, 2015 at CJ's. 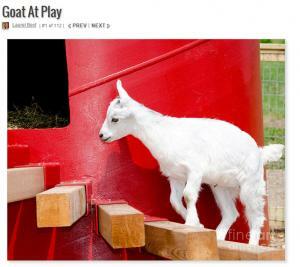 I am excited to enter my "Goat at Play" photo in the National TV Contest! I need 250 votes to be considered so your vote is very appreciated. Thank-you! 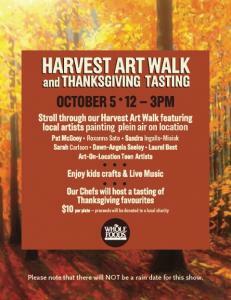 Oakville, ON � Whole Foods, 301 Cornwall Rd, Oakville, is having a Harvest Art Walk on Sunday October 5th from noon until 3pm. Laurel Best is one of the artists that will be painting at this event. 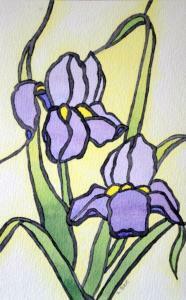 Laurel has been painting in watercolours for 20 years. 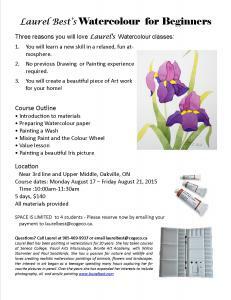 She has taken courses at Seneca College, Visual Arts Mississauga, and with Wilma Stammler. She has a passion for nature and wildlife and loves creating realistic watercolour paintings of animals, flowers and landscapes. Her interest in art began as a teenager spending many hours capturing her favourite pictures in pencil. 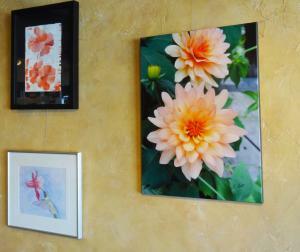 Over the years she has expanded her interests to photography, and more recently oil and acrylic. 1. You will learn a new skill in a relaxed, fun atmosphere. 2. No previous Drawing or Painting experience required. 3. You will create a beautiful piece of Art work for your home! Materials fee is $40 or you can bring your own materials, contact me for a material list. SPACE IS LIMITED - Please reserve now! 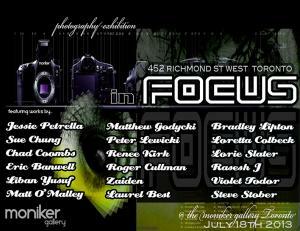 July 18-24, I'll be participating in a group photography exhibition, inFOCUS, at Moniker Gallery (452 Richmond St. W., Toronto, Ontario) Gallery hours 12-6 p.m., Closed Monday. Opening Exhibition is Thursday, July 18 from 7-11 p.m.
Free entry, snacks and entertainment!